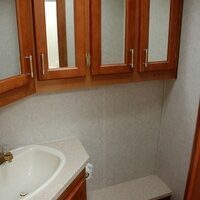 The RV bathroom is a common source of RV odors, hot water issues, and DIY repairs. Here, RV owners share their personal experiences fixing RV plumbing issues -- including DIY RV faucet repair, DIY RV shower repair, and DIY RV toilet repair. Also, see the best bathroom features to look for in an RV, how to get hot water faster, camping shower tips, even the best RV toilet paper! If you haven’t had much exposure to the RV lifestyle before, then you’re probably wondering what Class A, B, and C are all about. 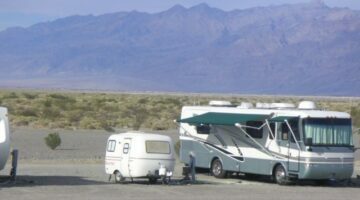 Here are the advantages and disadvantages of the 3 RV types. Here are some tips to keep in mind when you’re shopping for your next RV. They’re especially important if you’re going to be on the road for an extended period of time or planning on becoming a full timer. These tips will keep you not only clean, but happy with your RV bathroom! 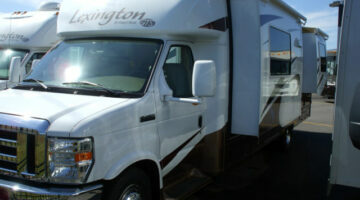 RV plumbing problems such as leaky faucets or shower fixtures are easy do-it-yourself repairs. Your best bet is to spend a few extra bucks and upgrade to household quality faucets & fixtures. Here’s how to replace the bathroom faucets, kitchen faucets, and shower fixtures in your RV. When your RV toilet starts giving you problems, it will probably be cheaper to just replace it with a new one. It’s a good do-it-yourself project. This video shows you how to replace the RV toilet yourself. Do you like a nice hot shower? Learning how your RV water heater works will prevent costly operator error damage. You can even fine tune it to get better performance, another way to increase reliability. This video will show you how to do it. Campground Shower Or RV Shower, Which Is Better? Do you use the on board RV shower or is the campground shower more to your liking? I hate on/off showering so a larger on board water heater makes sense for me. Got a leaky toilet? Here’s how to fix your leaking RV toilet, plus tips for replacing an RV toilet. Keep in mind, a leaking RV toilet can be caused by a number of things. Aqua Magic toilets produced by Thetford are the most common toilets found in all but the most expensive of RVs. One nice feature of the Thetford RV toilet is the fact that Aqua Magic parts are readily available. 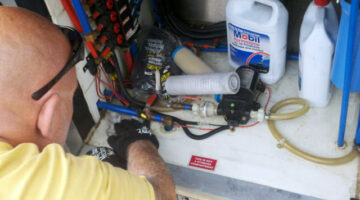 As a result, repairing rather than replacing the RV toilet is a common practice. Here’s how to repair your RV toilet. 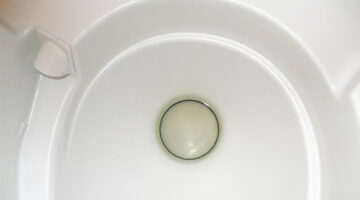 How to repair or replace an RV toilet when it springs a leak inside your RV, motorhome, or travel trailer. Interior decorating for RVers… Some tips for decorating your RV in order to personalize it to meet your needs and your own tastes. We cover everything from artwork for the walls, to bathroom accessories, throw rugs inside the RV, quilts, blankets, and storage issues. 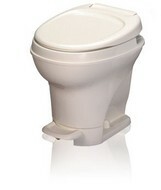 RVers and those who spend a lot of time in a motorhome will appreciate this ‘septic tank safe’ toilet tissue.